Flavius Claudius Iulianus Augustus, also known as Julian the Apostate, was Roman Emperor from 361 to 363. Julian became Caesar over the western provinces by order of Constantius II in 355, and campaigned successfully against the Alamanni and Franks. In 360 he was proclaimed Augustus by his soldiers, sparking a civil war between Julian and Constantius. Before the two could face each other in battle, however, Constantius died, after naming Julian as his rightful successor. 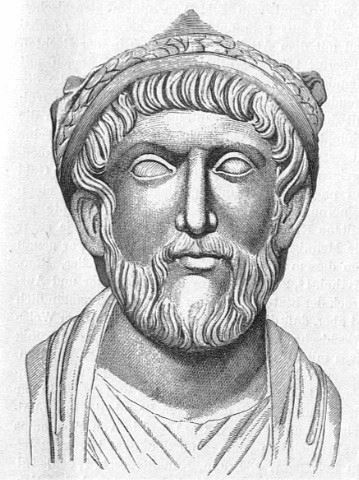 Julian was the last non-Christian ruler of the Roman Empire, and attempted to revive traditional Roman religious practices at the expense of Christianity. This caused him to be remembered as Julian the Apostate by the church. He died in 363 of wounds sustained in a campaign against the Sassanid Empire. Obverse: Helmeted, diademed and cuirassed bust l., holding spear and shield. (7) Julian II 355-361 A.D.
Ref: unlisted, RIC VIII Antioch 219 var.